Located just north of town, Egg Harbor Lodge is nestled back off of Rt. 42 overlooking the bay. Fantastic water and sunset views! Egg Harbor Lodge offers a tranquil and secluded environment and some on-site recreational activities as well. Not many places in Door County with sunsets better than here! What memories are made of! We have toured many places all over Door County, and water views are a premium. Well, the water view from Egg Harbor Lodge is more than magnificent! It is unobstructed, scenic with pines and trees on the shoreline and just breathtaking. 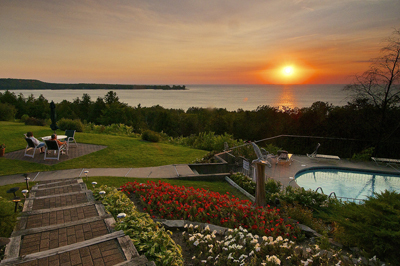 If you like glorious sunsets, there aren’t many better places in Door County to see one than here. See the phto to the right - pretty awesome! And free wireless internet too! We met with Sarah Hastings-Sawyer who owns and runs the lodge along with her husband Mark. She gave us a grand tour of the grounds and the rooms. While we toured the well-manicured grounds with geraniums everywhere, we spoke with a couple of ladies who have come here every year for 20 years. Nancy and Joyce said “This is the best place in Door County,” then they quickly added, “Don’t tell anybody about it!” Well, we have to – it’s our job! Sorry ladies! Catering to adults, this lodge offers 25 rooms, including one 2-bedroom suite. We took a look at some representative rooms, looking at #123 which was fully carpeted, with a king bed, floral couch, wet bar, fridge and coffee maker. A table, a couple of chairs and a TV complete the offerings here . . . except for the sliding glass doors to the balcony and magnificent view of the Green Bay waters! Most of the rooms have king beds, some have queens – so ask if this is important to you. The rooms are clean, comfortable and off the road so you miss potential road noise – an extra benefit! 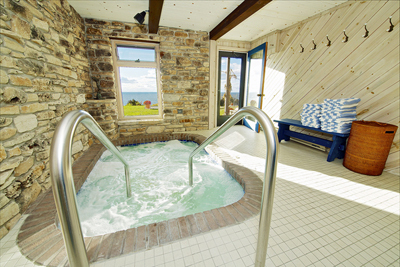 Some rooms have double whirlpool baths as well. Visit their website for all the details. 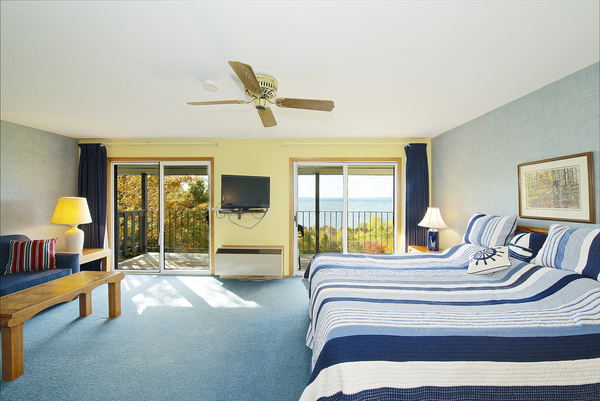 All rooms have a view of the bay waters! We next toured the Stone Hearth Suite, a two-bedroom suite, which was awesome. The suite is done in blue tones, and includes a wonderful living room with fireplace, full kitchen and two bedrooms. The master bedroom has a private bath, while there is a second bath down the hallway. 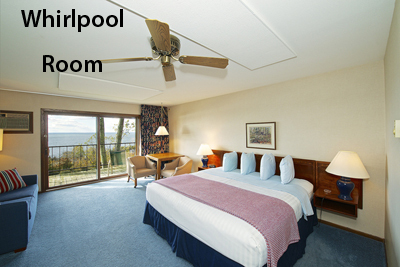 This suite also has a whirlpool room – yes, a whole room just for the whirlpool! We can’t imagine not liking this suite. And the deck offers the same fabulous view of the shimmering waters below. Wow. The outdoor pool area is very pleasant, with tables and chairs - you can see yourself just sitting out there relaxing as the sun goes down, offering a very nice view over the trees below and the water just beyond. An indoor whirlpool offers soothing comfort. There is a hiking/fitness trail and a tennis court as well. Want to bicycle somewhere and didn’t bring one? Bicycles are available – just ask! Open 6 months, May — October. Always check with the innkeeper for current rates and availability. To give you an idea, rates can range from $115 - $170 a night for 2 people in a room - depending on the month and the accommodation selected. The Stonehearth Suite is about $275 a night for 2 people, and can accommodate up to 4 for about $400. No pets allowed, and smoke-free since 2000. Take a close look at Egg Harbor Lodge – we think you will find this lodge to be a wonderful retreat, with sunsets that memories are made of – so give them a call, or visit the Egg Harbor Lodge website right now! And please tell them that you found them on DoorCountyNavigator.com!